Bring the cooking pot to the stove and start heating up the solution. 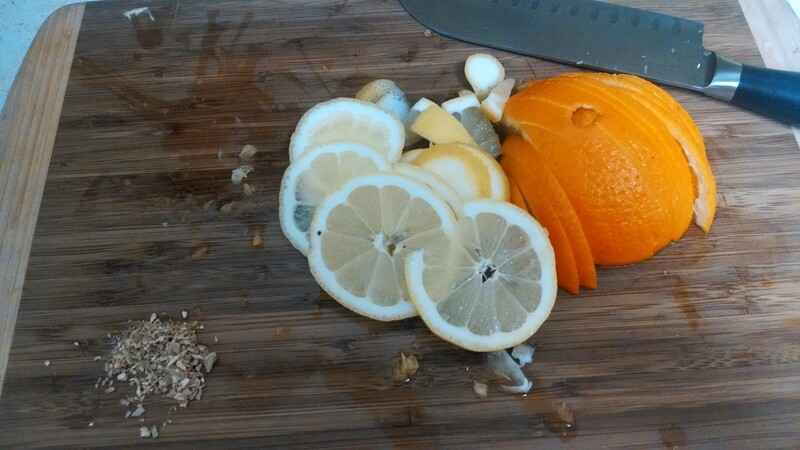 While the pot was heating I sliced the orange and lemon into small thin slices, rind and all, and added to the solution while stirring. Then I added the teaspoon of dried ginger and stirred again. Lastly, I added the 2 pounds of sugar and stirred well until it was mostly dissolved. 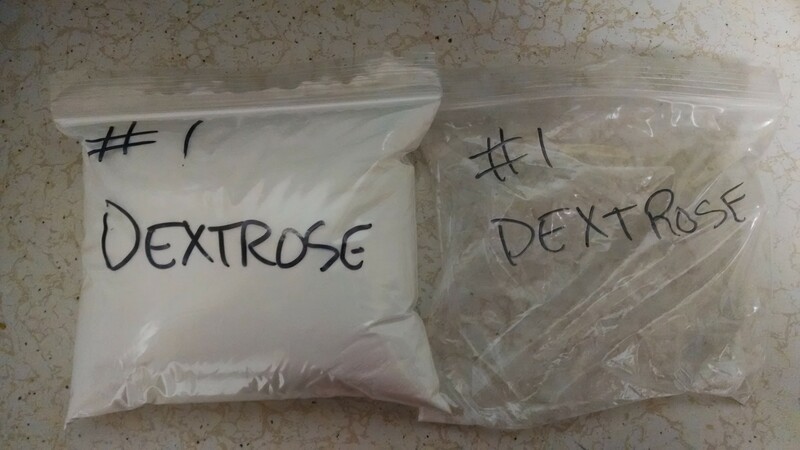 After speaking with an employee at one of our local fermentation stores we decided to go with using Dextrose for our sugar. Dextrose is pure glucose derived from plants (usually corn) and does not add any additional flavors to the wine that cane sugar or honey tends to do. I put the lid on the pot and turned it up a bit more so that it would come to a boil. Once at a rolling boil allow mixture to continue a slow (almost simmering) boil for 20 minutes. Don’t let it get out of control like I did as my boil ended up being more like an intense churning – a simmer is fine. After 20 minutes I turned off the heat and allowed it to cool a bit before restraining again back into the stone crock. 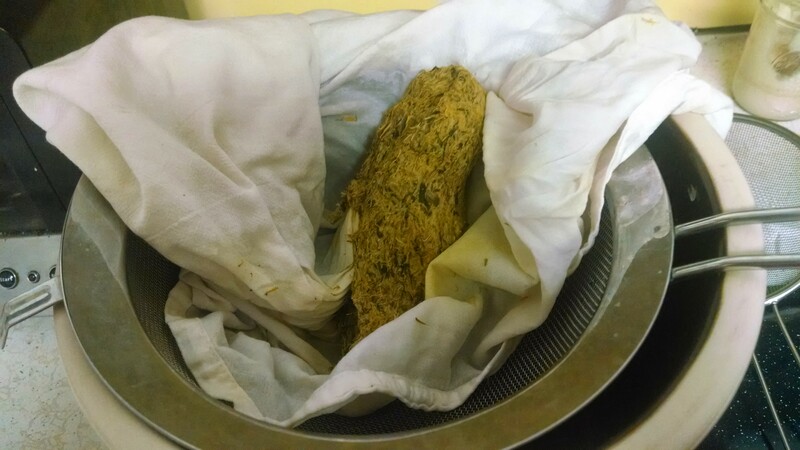 I would recommend using the cotton towel again so that the bits of ginger doesn’t get into the solution. I did not do that and so I have some bits in my fermenting wine. Pitching yeast simply means adding yeast to the juice or infusion. Allow the infusion to cool which may take up to an hour to get to a cool enough temperature for the yeast to thrive. This is where the candy thermometer may come in handy to get the temperature down to a specific degree. I had some difficulty determining what was the best temperature to pitch yeast. Some say 60-70 degrees F while others talked about pitching at higher temperatures for different results. I decided to stick with the round number of no higher than 100 degrees F and waited until the thermometer registered 100 or below. We got a wine yeast packet from the fermentation store that was also recommended by the employee. This was kept in the refrigerator until we were ready then it requires activating the yeast by slapping the bag so that it begins to mix and activate. Each yeast mixture or types of yeast are different so just follow the instructions on the bag. Add the necessary amount of yeast and stir. I really wanted to get away with not having to get a carboy and airlock, mainly because I was lazy and didn’t want to pay for it. So for the first couple of days we just covered the crock with a plate that fit completely over the top so that limited air would get in but the gases could still escape. 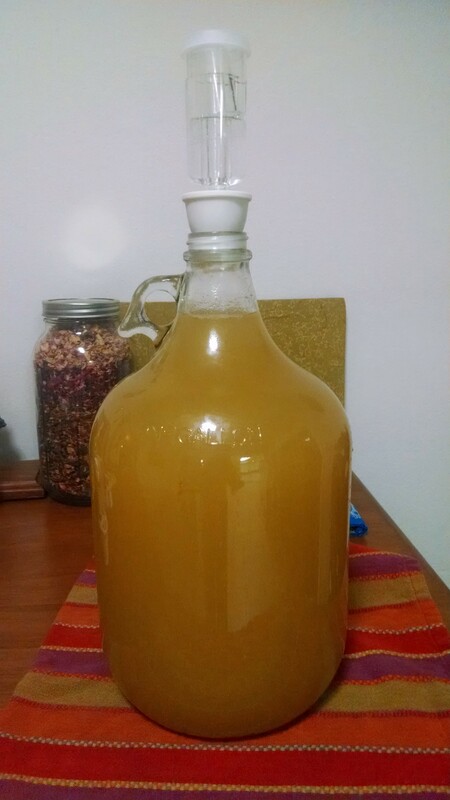 I finally broke down realizing that I did not want to risk getting wild yeast and other contaminates into my wine and so found a gallon size glass carboy and airlock kit for under $30.00. The wine can bubble and ferment for as short as a week or for as much as 3 weeks. You will know it is done when it stops its bubbling. So far my wine has been bubbling for a week and half and has barely slowed down at all. Stayed tuned for part 3 – bottling! 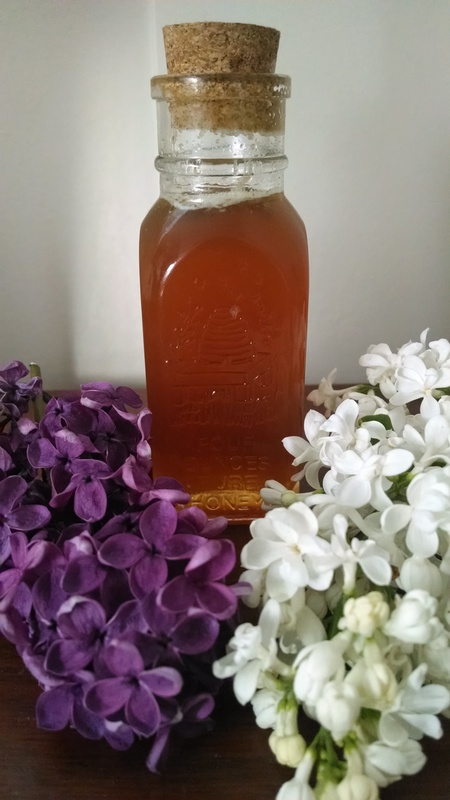 Dandelion Wine is the spring classic beverage for wild food and wine lovers alike. For the past 5 years I have been telling myself “This is the year I will try my hand at wine!”, and then the Dandelion Flowers fade away with late spring and my window for gleaning has passed. I am pleased to announce that I have beaten the procrastinator and I did it. Google has no shortage of variations on wine recipes so I wanted to record my own experience with some tips that would have been helpful for me in the beginning. 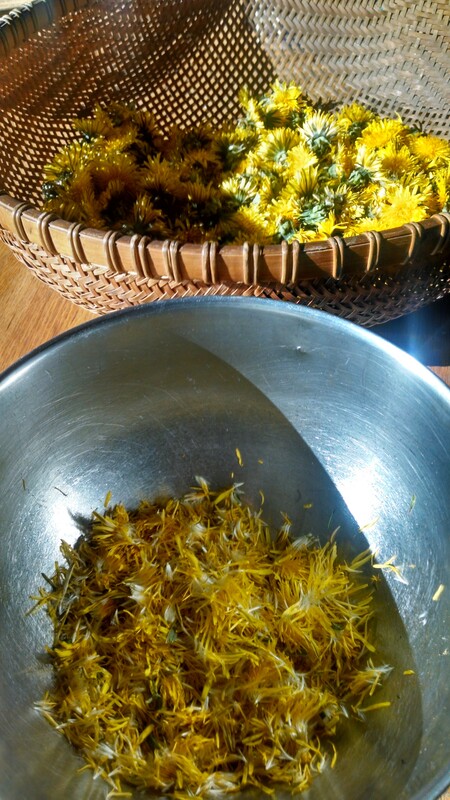 Begin by collecting the flower heads of Dandelions. The first step of this process really only needs the crock, flowers, and water so you have a few days to get the other items together. It’s not as simple as just pulling off the heads from the stem! 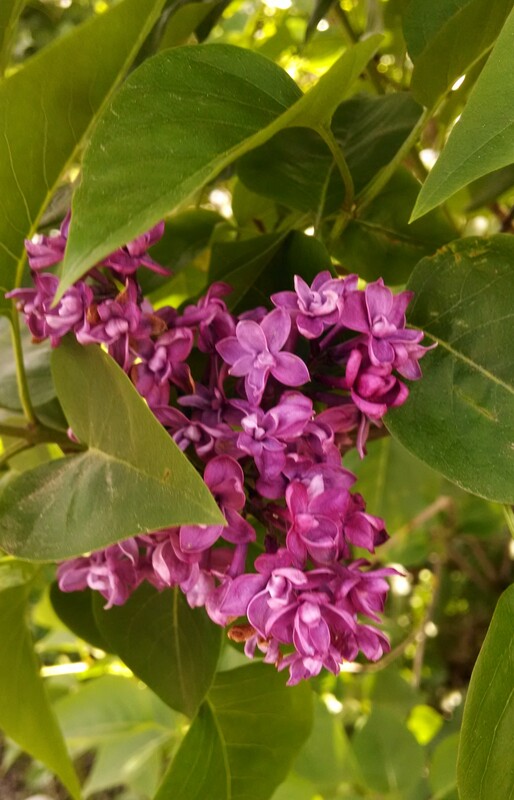 The trick is to get only the yellow petals and not (or as little) as the green sepals as possible because the green parts are quite bitter and will alter the flavor of the wine. My husband and I found two different ways to do this. The first way is mine. 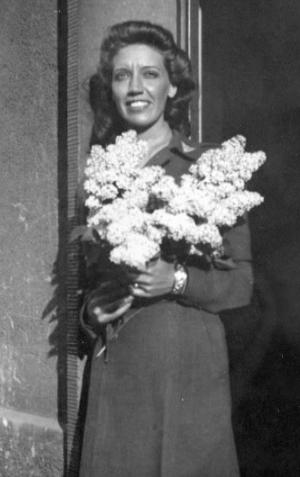 With my harvesting basket in hand I go out on sunny days when the flowers are in full bloom. Side note – the Asteraceae Family have many sun loving plants including the Dandelion. They will actually open in the morning and close up at night. The fancy term for it is “sleep of plants”. After popping off as many heads as I can in a few minutes with my basket I then grab another bowl to throw the discarded flower bits. Using my finger nails to slice the flower down the middle so that it will open flat I pinch off the petals pulling it away from the head of the flower until nothing is left but the green parts. FYI your hands will get very yellow and sticky! Matt on the other hand used scissors (nice kitchen shears) to cut the green sepals and lower portions off leaving just the petals. His lack of fingernails made it difficult for the pinch and pull method. It takes a lot of time and patience to get a full gallon of flower petals so my solution was to gather each evening after I came home from work and put them in a gallon size zip lock then froze the entire bag. It took me probably about 5 days to gather enough during the week then freezing to fill the entire bag full. I am lucky to have plenty of Dandelions in my yard to yield several batches of wine if so inclined. Do be sure you are harvesting from a place that is free of chemicals such as pesticides or herbicides. Ants love Dandelions and seem to be a major pollinator. 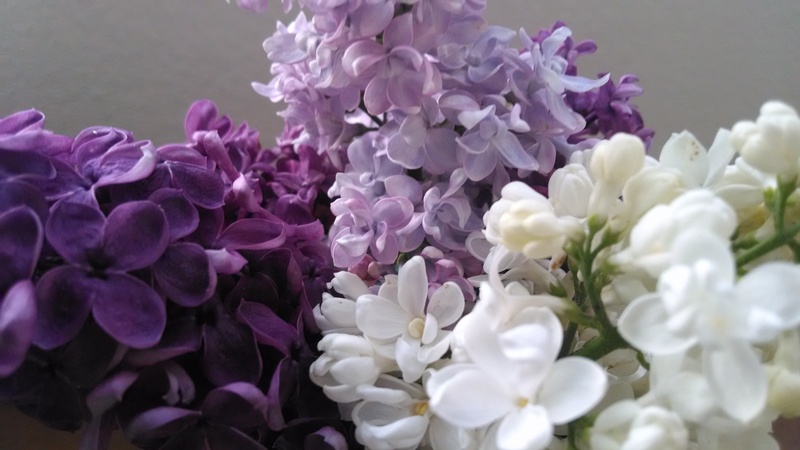 We found that if we came to a bunch of flowers crawling with ants to just leave the bowl full of freshly harvested flowers outside so that the ants disperse on their own. Formic acid (from the ants) will probably not be a great additive to the wine. 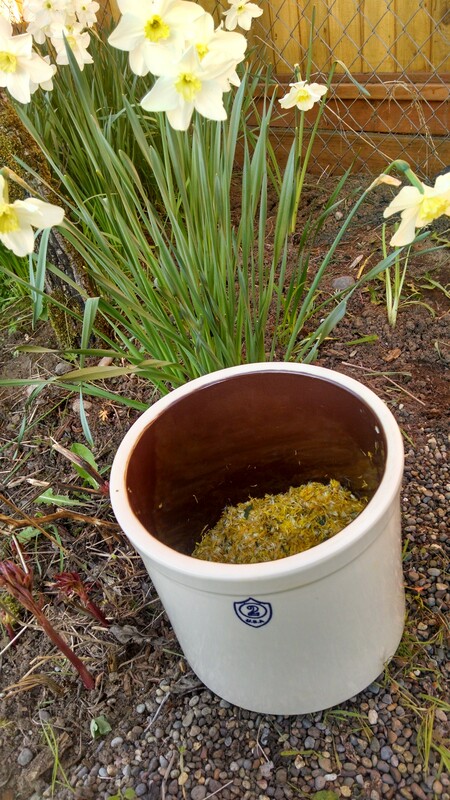 Once I gathered the full gallon of flowers I emptied the bag into my 2 gallon crock then boiled about a gallon and a half of water. 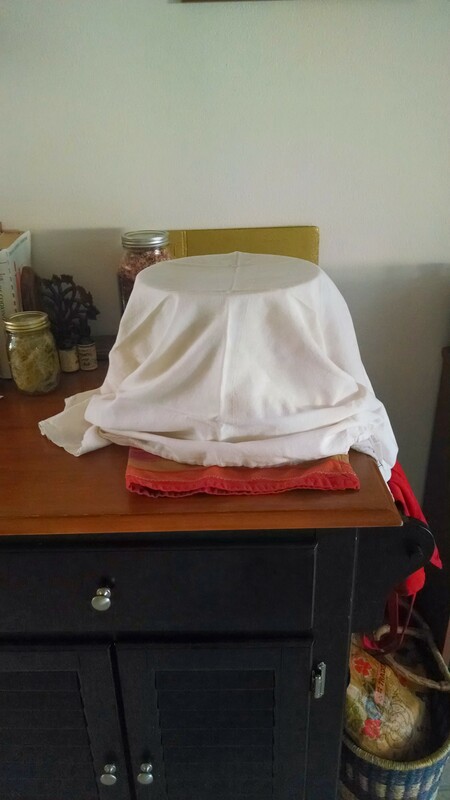 Pour the boiling water over the flowers, stir, and cover with the cotton cloth. 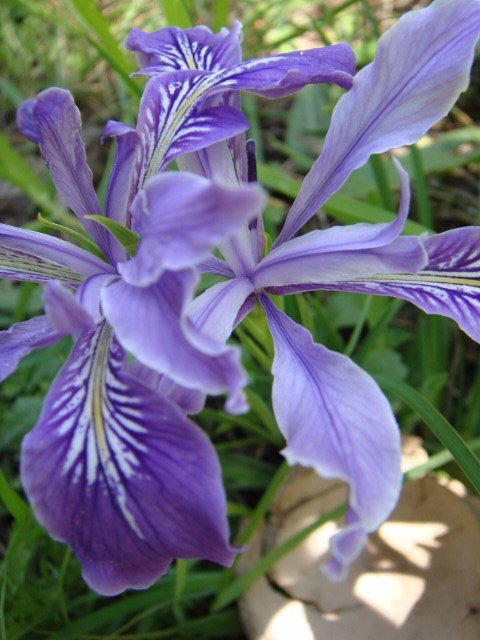 Allow the petals to infuse for 3 days. 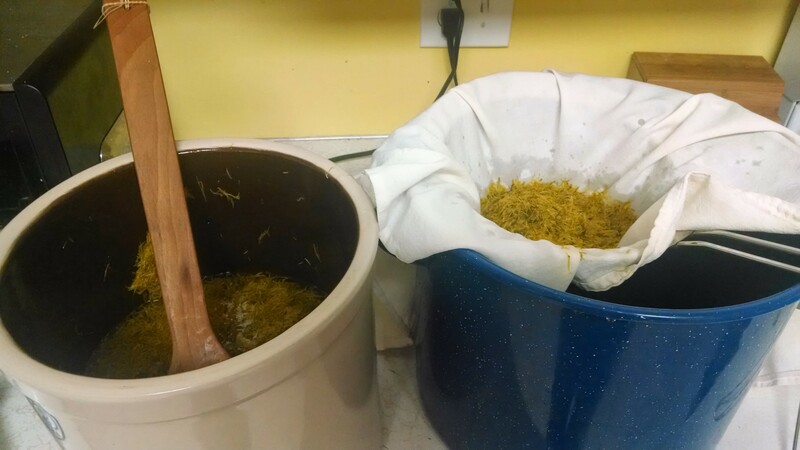 This concludes part 1 of making Dandelion Wine. Keep an eye out for part 2!